I have several kanelbulle recipes bookmarked but it is the adorable illustration from Johanna Kindvall’s kokblog that tempted me the most. I particularly like the diagrams showing how to shape the buns for cardamom almond variation. I adapted her recipe with a few minor changes such as using instant yeast, all purpose flour, salted butter, ground cardamom, and my preferred 15 seconds knead-and-rest mixing method. It is important to egg wash the buns thoroughly before baking. The dough isn’t lean thanks to milk and butter but you can’t get the lovely even golden hue if you miss a few spots. 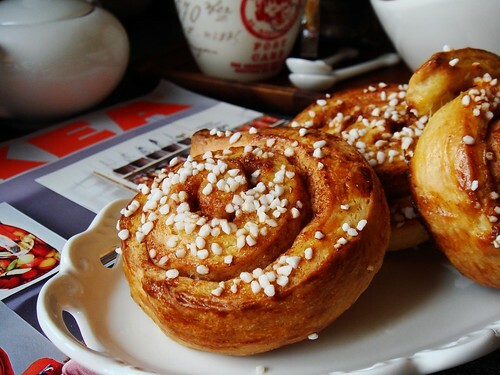 I also sprinkled very generous amount of Swedish pearl sugar over the egg washed-buns because the buns expanded during baking and distributed the sugar by itself. 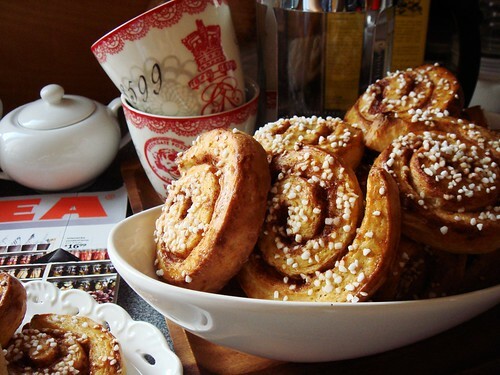 Some of my kanelbullar looked a little too thin. Next time I will make sure to slice them into thick 1-inch pieces when I divided the dough. 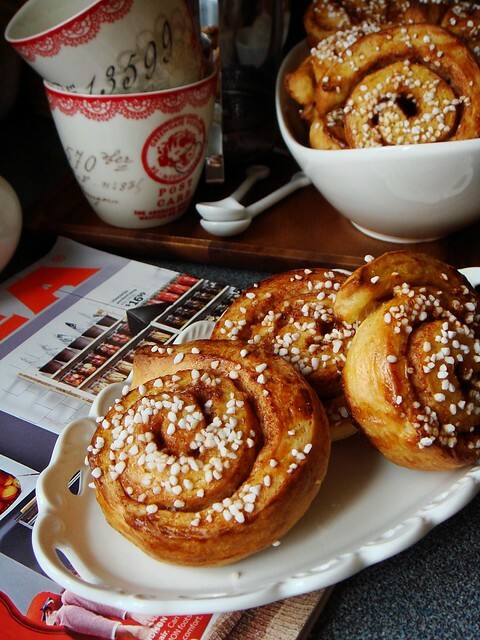 The kanelbullar are perfect match for coffee, obviously. 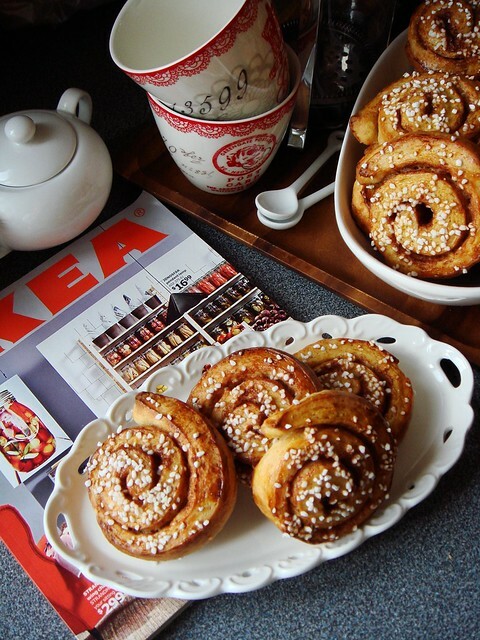 (Time to fika!) Thanks to their smaller size, I can easily go through a couple of them without thinking. 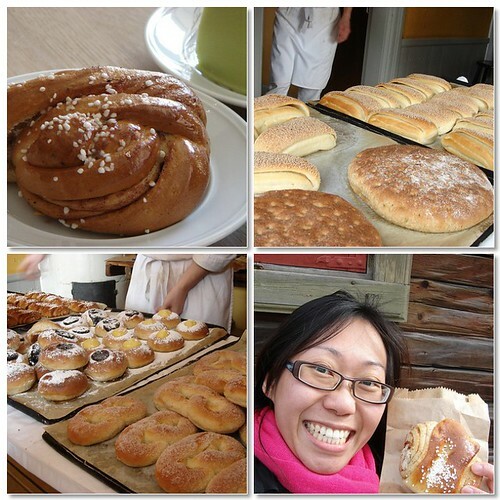 But then I remember this info graphic on Swedes & Their Sweet Tooth (scroll to the middle of the page) and think of all the buns NOT burnt from exercising…and I stop at just one. Let me tell you, they are even harder to resist than the smell at IKEA check out line. Now who wants to join me for coffee?